If you’ve ever eaten a salad for dinner and thought “I am only here for the croutons,” then let me say that you are heard, and you are seen. It may sound dramatic, but a dinner salad without those golden hunks of salty, crunchy bread in the mix can leave me feeling downright deprived. Luckily, I have a salad for you that is extremely crouton-forward. Not just any croutons, but “hand-torn” croutons. It’s an annoyingly pretentious phrase, but for any eye-rollers out there, it’s the haphazard tearing into irregular, craggly-edged chunks, rather than meticulously cubing them with a knife, that makes them spectacular. This inexact technique allows some of the bits of bread to fall away and become crumblike and crunchy, while the rest stay larger, like delicious golden-brown geodes with wild-looking exteriors and tender, chewy insides. How the croutons are cooked is just as important as the way they are torn. To reach their full potential, they must be tossed in enough fat to become crisped, but not so much that they become greasy. Olive oil is great here, but why olive oil when you can use chicken fat? 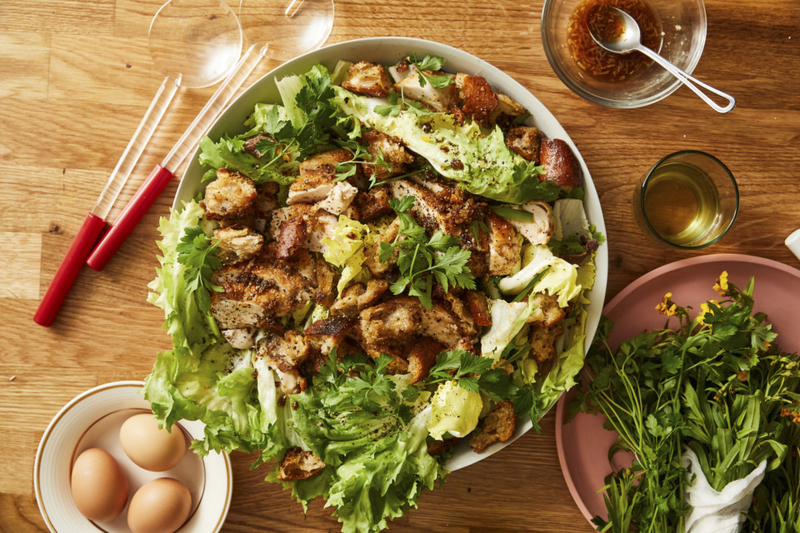 For this salad, since you are also including crispy-skinned chicken that will give you said fat, you can, and you should. 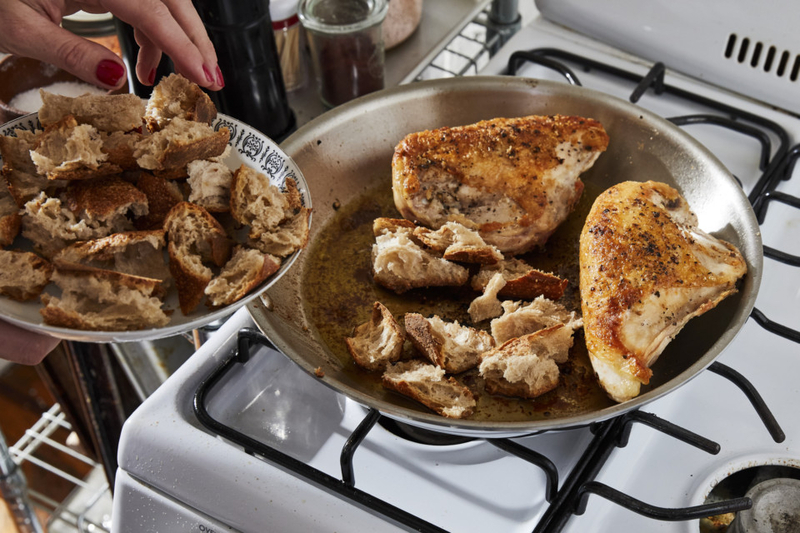 After searing your chicken (one of the few times I prefer the leanness of bone-in, skin-on breasts to the fattier thighs) in a skillet until browned, toss your newly hand-torn bread in the rendered fat and juices that have been seasoned with a few anchovy fillets for added funky saltiness. From there, the whole skillet heads to the oven so the chicken can finish cooking through while the pieces of torn bread become golden brown, fulfilling their destiny to become croutons. There is also a showering of hard, salty cheese, which almost puts this salad into chicken Caesar territory, which is kind of the idea here. 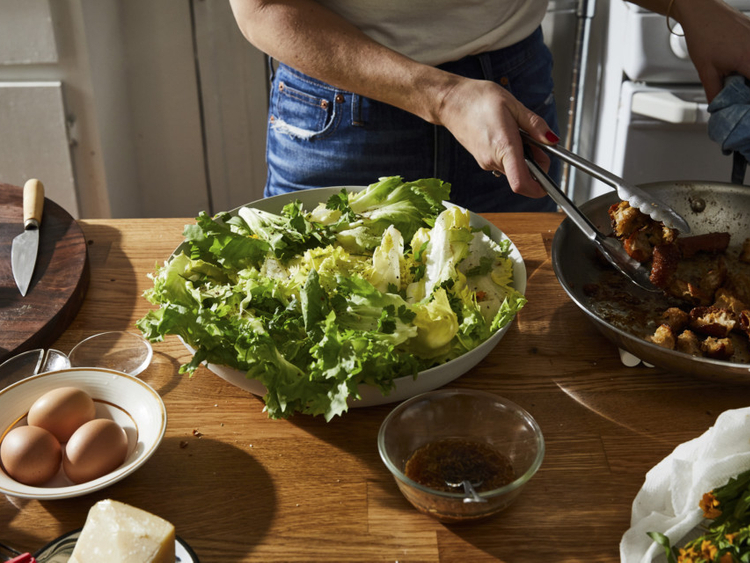 For creaminess, the assembled salad is topped with a few gloriously orange raw egg yolks, to be burst upon eating and mixed in with everything else (yes, this is safe). If you don’t love a raw egg yolk, you can use a soft-boiled jammy egg, crispy fried egg, or leave the egg out altogether, but we’ve come so far on this Caesar-esque journey, it would be a shame to turn back now. 1. Heat oven to 190 degrees Celsius. Season chicken with salt and pepper. Heat 1 tablespoon olive oil in a large skillet (preferably cast-iron) over medium-high heat. 2. Add chicken, skin-side down, and cook without moving until the pieces are golden brown and crispy, 5 to 8 minutes. Flip the chicken and continue to cook until well browned on the other side, another 5 to 8 minutes. 3. Move the chicken to one side of the skillet and tilt the skillet a little so that the fat and drippings pool on one side. Add the anchovies and let them sizzle a bit to melt down. Add the croutons, along with 2 tablespoons olive oil. Season with salt and pepper and toss them to coat in the anchovy-chicken fat. 4. Place the skillet in the oven and roast until the chicken is cooked through and croutons are golden brown and crispy, 12 to 15 minutes. 5. Meanwhile, whisk the grated garlic, lemon juice and soy sauce in a small bowl and season with salt and pepper. 6. Place escarole and parsley in a large bowl or on a platter and dress with lemon-garlic mixture. Season with salt, pepper and more lemon juice if you like. Drizzle with remaining 2 tablespoons olive oil and shave some pecorino over the whole thing. 7. Remove the chicken from the oven and let it rest a minute or two. Cut the meat off the bone and thinly slice. Place on top of the salad, along with the croutons. Top each serving with an egg yolk, if using, and more anchovies, if you like.